If you’ve been looking into high-tech products for leisure and domestic use, you’ve probably heard of Gtech. This UK-based company has made a brand for itself by delivering high-quality floor-care and gardening equipment. In this article, we’ll take look at their Falcon cordless lawnmower, and its technical features, price and available Gtech coupons. Who does the Gtech Lawnmower work? 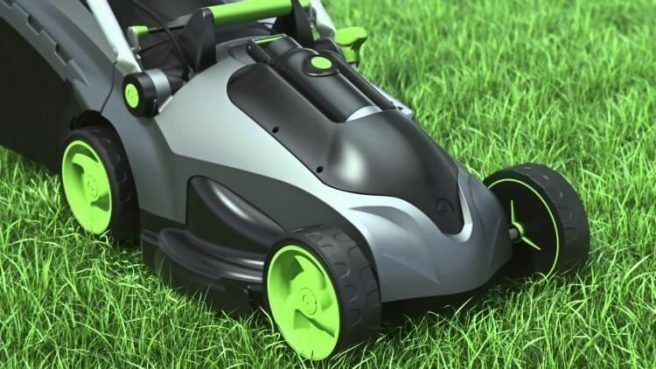 The first thing you’ll notice about Gtech’s lawnmower is how easy it is to use. If you’re tired of dealing with electric cables and those noisy petrol motors while mowing the lawn, the Falcon might be the right product for you. All you have to do is insert the battery, press the lever and you’re good to go. The Falcon is equipped with large wheels, which makes the process of lawn mowing feel positively effortless. Thanks to its powerful motor and carbon steel blades, the Falcon can deliver both the wide cut and the neater edges. The cutting width is a decent 430mm, and the cutting height can be adjusted between 3 and 8cm. Whether you’re going for the first cut of the season or a mid-summer finish, the Falcon can be the right tool for the job. The flap on the 40-litre collection bin will let you know when you need to empty the container. Though it’s not exactly miniature-sized, this lawnmower won’t dominate your shed either. To that end, you can fold it down to a more compact size with a simple click of a button. Of course, you’ll have to remember to put your battery on charge before that. The charge time is a long five hours, which is one of the rare disadvantages of this product. If you’re not satisfied with the Falcon for whatever reason, you can always return it and get a full refund. The product comes with a standard 30-day guarantee. You also get an additional 2-year guarantee, which will keep you covered in case of faulty manufacturing or any sort of unpredictable behavior. Moreover, the shipping is free to all UK customers, including those living in Northern Ireland. There is no need to use a Gtech promo code to qualify for free shipping. Should you buy the Gtech mower? As for whether the Falcon is the right lawnmower for your needs and sensibilities, that’s up to you to decide. For our money, this product is very much worth it. Messy petrol machines and electric cables do get on one’s nerves after a while, and the Falcon is the exact opposite of that. Plus, Gtech has an excellent reputation in the industry and a history of putting out high-quality electric power tools. Once you add the two different kinds of warranties, it becomes clear you’re getting a lot of value for your money. The official cost of the Falcon cordless lawnmower is £399. However, you can use a Gtech coupon to make the final price a bit more affordable. Once you get to the checkout, you should notice a promo code field. Simply enter the following Gtech voucher code: CLM299D. Once applied, this Gtech coupon code will get you a £50 discount, which will bring the price down to just £349. As far as we’re concerned, that’s a bargain!